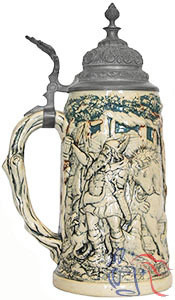 “Hermann” (or “Arminius” as he was known to the Romans) was the leader of the German tribes in their crushing victory over three Roman legions in the 9 A.D. Battle of Teutoburg Forest. 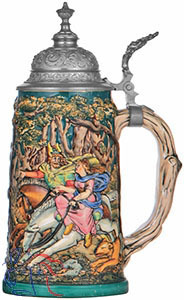 One side of this stein (right) shows Herman eloping with his woman Thusnelda following the battle. Her father Segest, who had promised Thusnelda to another tribal leader, is shown on the opposite side (below) swearing revenge.